The following is the complete text and plates of Chapter XXI of Harry Price's Confessions of a Ghost-Hunter (Putnam, 1936) in which he describes the Indian Rope tricks of English-born savant 'Karachi' that were witnessed in January 1935. ﻿I have seen the Indian Rope Trick. At least, I have seen a clever representation of that great illusion which has intrigued newspaper correspondents for so many years. The performer of the Trick was Karachi, assisted by his diminutive son Kyder, aged eleven. Before I proceed further, I had better describe the Rope Trick of tradition. There are many versions, but the story which makes its perennial appearance in the Press is more or less as follows: a fakir, dressed in flowing garments, and accompanied by one or more assistants, selects a site for the Trick and proceeds to collect a crowd, which he carefully places. The performer takes a long rope, uncoils it, swings it round his head and lets the free end soar skywards-where it remains. With words which sound like imprecations, he commands a frightened-looking youngster to climb the rope. The boy obeys and disappears into the clouds. With a knife between his teeth the fakir follows the boy, disappears, and a few moments later, to the accompaniment of ear-piercing screams, the horrified spectators see pieces of boy, mutilated and gory, tumbling out of the blue. When the shock of the 'tragedy' is at its height, they are amazed to see the fakir re-coiling his rope, at the same time as the 'victim' is found at the back of the crowd, begging for baksheesh. That is the traditional Rope Trick, stripped of its trimmings. ﻿correct sequence of events, mal-observation, ignorance of deceptive methods - or sheer lying. There was always something that would not stand up against cold analysis. Certainly, there have been rope tricks in the form of conjuring illusions or stage turns, and I will deal with these later. Also, there have been seen boys balanced on tops of bamboo rods, which travellers termed the Rope Trick. But that was because they could not tell a bamboo from a rope. The mass-hypnosis 'solution' is merely a legend: science will not admit that a number of persons can be hypnotised simultaneously under the conditions imposed by an itinerant showman. On April 30, 1934, one of the magical societies convened a meeting at the Oxford House Theatre, Marylebone, in order to kill the Rope Trick stone dead and give it a decent funeral. The Trick was rather knocked about, but it survived, as the subsequent correspondence in The Listener proved. I was invited to the obsequies and on the platform with me were the late Lord Ampthill, a former Viceroy of India, and several other distinguished persons who had lived in the East, and who had gone out of their way to see the Trick. But not only did they not see it, but they could find no responsible person who had. They received accounts from travellers who had mistaken the bamboo trick for the genuine article, which rather reminds one of the old lady who, after a tour of India, remarked that the most inspiring spectacle she had seen was 'the sun setting behind the Aga Khan'. I reiterate that there is no scientific evidence for the Rope Trick in its traditional form, and the Oxford House meeting confirmed this view. 1. See The Listener from the end of May 1934 until April 1935.
he enclosed the pictures themselves to prove it. The photographs were reproduced (1) and they looked impressive. There was nothing ambiguous about them. There was the rope, straight up in the air, apparently defying gravity, with Karachi squatting at the base and Kyder, like a monkey, clinging to the top of it, several feet above the ground (see Plate XII). It can be imagined that The Listener pictures fell like a bombshell among the conjurers - especially those who were so certain that the Rope Trick could not be done, by any means. There were cries of 'Fake!' Of course: the Rope Trick must be a rope fake. As a correspondent in The Listener pointed out, 'What is a trick, if it is not a fake? Is a trick less of a fake for being "genuine", or is a "genuine trick" a trick that is not a trick?' In the Concise Oxford Dictionary (3rd edition, 1934) the meaning of the word 'trick' is as follows: 'Fraudulent device or stratagem; feat of skill or dexterity, knack, precise mode of doing or dealing with a thing', etc. In other words, the Rope Trick is a trick. But the conjurers would not have it. They admitted that nearly all tricks are tricks, but that the Rope Trick is something else. They said - in effect - 'It is a supernormal trick'! That is, a trick that cannot possibly be done. So they offered any person five hundred guineas if he could do it. 1. See The Listener for Dec. 5. 1934. Arthur Claud Darby, and he is English) was invited to London, and I will now give the story of his somewhat protracted visit. After some correspondence, it was arranged that Karachi should be in London on the morning of December 31, 1934, prepared to do the Trick. He duly arrived at our rooms, complete with Kyder and full Eastern regalia. But, like a bolt from the blue, he informed me that he was not going to do the Trick, and that at least four days' preparation of the site was necessary. Also, he had to scour London to find a 'certain rare mineral' which had to be planted in the ground where the Trick was to take place. I informed Karachi that I had selected Mr. C. E. M. Joad's Hampstead garden for the demonstration, and that I was sure Joad would not mind how many rare minerals were planted on his property. I also told Karachi that a distinguished audience was awaiting us at Hampstead, and that he had better make his apologies to them. At Hampstead we were met by the editor of The Listener and his friends, and I had to break the news to them. They were not only surprised and disappointed, but somewhat hurt at Karachi's not warning them that he required four days in which to prepare the Trick. As some compensation for our trouble and loss of time, Karachi consented to don his Eastern robes and do a few rope-balancing feats, which were quite good. Feeling rather less disgruntled, we took Karachi out to lunch and asked him point-blank what he came to London for. His reply was to the effect that, given time, he was quite willing to do the Trick. He specified one of those wide, open spaces where he could work on the site without being overlooked. We agreed to all his conditions and found him a large field at Wheathampstead, a village a few miles north of Hatfield. He agreed to perform the Trick on the following Monday, January 7, 1935.
sun, cerulean skies, scorching sands, a - very convenient - hazy horizon, with attendant palm trees and Sons of the Desert. The field at Wheathampstead was not a bit like this: it was a cross between a quagmire and a brickfield. But to compensate for these shortcomings, it was next door to a comfortable inn, 'The Nelson', which was the agreed rendezvous. We arrived in a cold drizzle, which turned to snow, accompanied by a bitter nor'-easter . We found Karachi and his son in the bar parlour, all blacked up and wearing the robes of their profession: voluminous garments of red and yellow, with skyblue turbans. Kyder had bare feet. In another room of the inn we discovered the remainder of our party, which included the following: Mr. R. S. Lambert; Mrs. Mary Adams, of the Talks Department, B.B.C. ; Mr. J. W. Brown, the owner of the field; Professor C. Daryll Forde, the anthropologist, of University College, Aberystwyth; Mr. W. E. Williams, Secretary of the British Institute of Adult Education; Miss Ethel Beenham, Secretary of the University of London Council for Psychical Investigation; Mr. Alex. L. Dribbell, a student of the occult, and myself. Having fortified ourselves within against the elements raging without, we made our way to the field. Karachi had planted his rug on a slight eminence - an ideal pitch for the 'talkie' set-up which had been arranged by Gaumont-British Films. Before the Trick, Karachi did some clever sleight of hand work with a pack of cards which, after three minutes, were sodden with snow. He then very cleverly balanced a six-foot rope horizontally on his hand and vertically on his chin. Then I spoke a few words into the microphone by way of introduction, and Karachi commenced his great Trick, which I cinematographed. 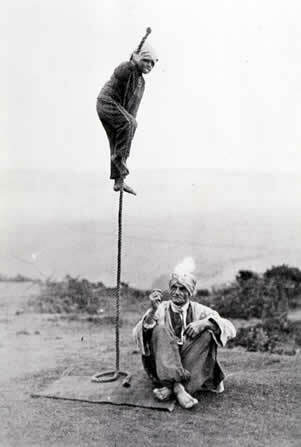 Karachi and his son, Kyder, performing the Indian Rope Trick. ﻿rope under a star-spangled velvet cloth which he used as a screen, an end immediately reappeared, pushed up from below with a jerky movement. It was quite rigid, and rose to a height of about five feet; it was then withdrawn. Another rope, about eight feet long and two inches in diameter, was then passed to us. It was unprepared, but very loosely woven. In the same way he placed the second rope beneath his cloth, and again an end appeared and crept upwards with a jerky motion. It was noticed that the rope was now tightly woven and very rigid. When about eight feet of the rope had been paid out, Karachi commanded his son to climb up it - which he did with considerable agility . We had seen the great Rope Trick! Arrived back in the more congenial atmosphere of the bar parlour, Karachi was about to tell me exactly how it was done. But I stopped him. No one needed telling how the Trick was done. It was obvious to every intelligent person within a radius of fifty yards that the showman had used a certain method of performing the illusion, and the effect was very good indeed. It would not be fair to give away his secret. His son, Kyder, did not disappear when he reached the top of the rope, but Karachi informed me (and explained the method) that even that classical ending of the Trick could be arranged. I congratulated him upon doing the Rope Trick so cleverly, and under such wretched conditions. I told him that, with a little more showmanship, he could make it even more convincing. In the hands of a Houdini, it would look like a miracle. But we did not grumble. We had seen the Rope Trick - and in a snowstorm! 1. See The Listener for Jan. 16, 1935. ﻿they did say, because we have been through it all before. But they tenaciously clung to their five hundred guineas. Another bombshell was in store for the conjurers: Karachi sent them a challenge, which was published in The Listener. (1) The terms were as follows: '(1) The conjurers to deposit the sum of two hundred guineas with a neutral party, who is to decide whether I have performed the Trick satisfactorily or not; (2) the rope is to rise up through my hands, while I am in a sitting posture, to a height of ten feet from the carpet on which I sit. It is to remain there erect while my son Kyder climbs up it, and remians with his hands at the top for at least thirty seconds while he can be photographed; (3) the rope shall be an ordinary thick rope with a good grip, which shall be supplied by any well-known rope manufacturer on a specification as to length and girth which shall be agreed between myself and the conjurers; (4) the place shall be any open place chosen by the neutral party, provided that its conditions are not dissimilar to those which obtain in India. This Trick ought to be performed as nearly as possible under natural Indian conditions. The neutral judge or judges should be satisfied that these conditions are fair to me. Furthermore, I am to be allowed access to this place for at least forty-eight hours previous to the performance, and during that access I must not be spied upon. This is in accord with what the Indians do, for they always perform the Trick on native ground, and never in the white man's private enclosure; (5) the rope shall be handed to me after examination at the commencement of the performance. The spectators shall be anywhere in front of my carpet at a distance of not less than fifteen yards. 1. See The Listener for Jan. 30, 1935. ﻿enlightenment they will accept my challenge, and this much-disputed tradition will become a reality.' The conjurers refused to accept Karachi's challenge. The question now arises, has the Rope Trick ever been seen in the East, in any form? I am certain that it has. The evidence for its performance is much too strong for us to deny that the Trick itself is a complete myth. But I believe that what travellers have seen is just a conjuring illusion, very skilfully produced. I not only believe this, but I have first-hand evidence that such is the case. I make no apology for quoting this evidence in extenso, as I believe it solves the mystery of the classic Rope Trick. 'The chief performer was Abu Nasser, an enormously tall Arab with a long white beard, dressed in a flowing garment (Haik) of dazzling white, and wearing white sandals. His assistants were two Arab men and a diminutive, thin Arab boy. They had brought with them an enormous basket and a carefully rolled up rope. 'We were placed in an exceedingly small roped-in enclosure and had to promise faithfully not to leave this on any account, as it would break the magic. I was at once struck by the fact that we were obliged to face the sun, and felt certain that this was not arranged by chance. 1. 'Das Fakirwunder des geheimnisvollen Seils', by 'Erik Jan Hanussen' (i.e. Hermann Steinschneider), in the Berliner Illustrierte Zeitung, Berlin, Oct. 31, 1930. ﻿'Abu Nasser and his assistants then threw themselves down and began incantations and prayers. This was kept up for fully over an hour. I immediately realised that this was solely done for the purpose of wearing us out, tightly squeezed together as we were in that small enclosure in the blazing sun, and thus prepare us for the illusion. Indeed, a few of the spectators felt ill.
﻿end of the rope ran out to a point, and, although the rope was really not so very long, it gave one the impression that it was of enormous length, reaching right into the clouds. 'The little boy, who was clad in a tight black knitted garment, was first to climb the rope. He did this with the agility of a monkey. Then Abu Nasser, a knife between his teeth, followed him. Suddenly - I could hardly trust my eyes - both had actually vanished. My friend and I looked at each other amazed, and might still be standing there struck, if a penetrating smell had not caused us to cough, when we also noticed that Abu Nasser and the boy had surrounded themselves with "clouds" by means of some "smoke"-producing preparation not known to us. This, together with the dazzling skies, the blinding sun in our eyes, and the hazy horizon, created the illusion bf complete disappearance. The whole had barely lasted a few seconds, when we heard terrible screams from above and the terrified spectators saw pieces being thrown down into the basket. First a pair of arms, then the legs, then the trunk, and finally the head, all blood-stained. 'During this time I had snapped pictures with my "Ika" camera, which I had carefully concealed in my belt, and the enlargements I made later on proved that the "limbs" were only stuffed rags which had been stained with animal blood. 'The next moment, it was clear to me what really had happened above, for when Abu Nasser was again visible and, holding the blood-stained knife between his teeth, climbed down, I could see that the little boy was concealed under his master's Haik, where probably the imitation '''limbs'' had previously been hidden. ﻿the basket and thus brought the poor child back to life. Sound and merry the young son of the desert jumped out of the basket, and went to collect his baksheesh (tip) as quickly as possible, whilst the minds of the spectators were still filled with horror and sympathy. Though I commenced this chapter by stating that, in my opinion, the Rope Trick has never been seen in its traditional form, (1) I will conclude by saying that I am equally convinced that the Trick itself has been witnessed as a conjuring illusion, accounts of which have been distorted and exaggerated by credulous travellers who were completely ignorant of the deceptive methods employed by the itinerant Eastern magician. 1. As this work goes to press, the author has been informed by General Sir Ivor Maxse, K.C.B., that he saw the Indian Rope Trick when a subaltern in India. It was performed in the traditional manner, and Sir Ivor thinks that the audience must have been hypnotised.